I love mega Delcatty and Lionoone! wow very cool, I really like all of them, but especially linoone and delcatty's! Now this right here is, why I wish the guys at Gamefreak would consider fan designs as inspiration for new Mega Evolutions. The types, the designs, all of these right here are just crazy good. 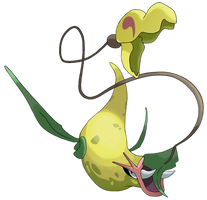 The base Pokémon are all instantly recognizable, yet they look a lot stronger without going too far and being more of a full on evolution. That's how to do Mega Evolution just right. Not to mention the shinies. While shiny Mega Linoone already is a big fav right there, that shiny Mega Sandslash is godly. The red spikes, the black armor pad things and then there's the two big grey spikes. This thing looks like one massive amount of hurt and I love that. Not a fan of megas but wow... really like linoone and arbok and delcatty! pretty cool designs! I love that mega sandslash! damn it people at Pokemon hire this artist right now. Agreed. These mega evolutions must become real. Simply, amazing work!! Honestly, there are many goods megas out there, but the detail and aesthetic brought in your designs surpasses them all in my eyes! Love the choice of megas on the post as well! 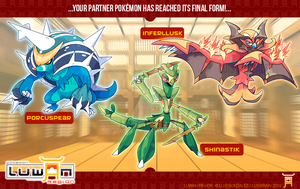 Great desings, they would be the perfect megas for them ! That linoone and arbok Mega are excellent. Poor Delcatty is so weak stats-wise: it deserves an evo, and that evo deserves a mega, haha. Mega Arbok looks REALLY great!!! My favorite Mega I've seen, real or fake! I don't see mega fearrow. cool! they are all AMAZING!! keep it up.